The symbol of the South Seas, palms and beaches was being grown specifically for production as early as 1642 by Spanish settlers in the Philippines. The Philippines remains the largest producer of coconuts to this day, alongside other export countries like Sri Lanka, Malaysia and Indonesia. Coconuts are also produced on a smaller scale in Côte d’Ivoire and the Fiji Islands. 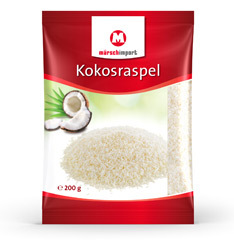 To produce desiccated coconut the shells are removed after the harvest and the flesh of the fruit is then washed, shredded, pasteurised and dried. It’s not just home bakers that swear by the refreshing taste of desiccated coconut, as this fruit has also become an indispensable ingredient for the confectionery industry.